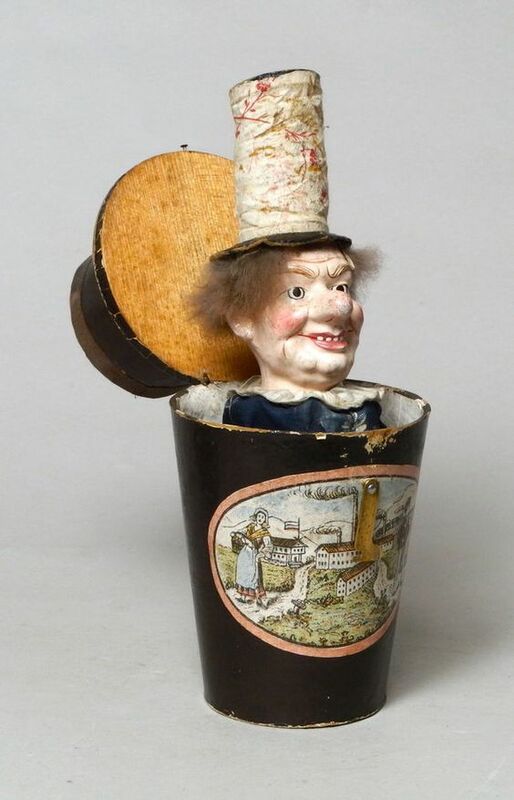 Above is a beautiful toy magic set from the 19th century. The pieces, wool, wood, cloth and metal come in a beautiful wooden box. Each year I enjoy attending the Antiquarian Book Fair, which takes place in New York City's Park Avenue Armory each Spring. It is an astounding collection of book dealers who exhibit not only rare books but antique maps, photographs, autographs, Americana, and even a few toys. Some of the artifacts are close to 1,000 years old and just about all are fascinating. Here are some pictures I took at the Fair. The above artifact is a game / puzzle with some very weird images. There appeared to be about 5 wooden sets in the wooden box. The idea is to jumble them all up and then put them back together again. The above is not a toy but it is a wonderful letter from the real Christopher Robin Milne. Above is a game utilizing a silver ball and a track. It dates to World War I and the idea is to get to Berlin. The most important and relatable moment in puzzle history has to be the story of Alexander the Great and the Gordian Knot. The citizens of Gordium (now located in Turkey) claimed that the knot was actually a puzzle designed to secure the chariot of Gordius, King Midas's father. The knot, however, was more than a k not. It came with a prophecy: Whomever could untie it would become the ruler of all of Asia. Alexander, a man of action if ever there was one, obviously did not have the patience to figure out how to untie it. He cheated! Alexander solved the Gordian Knot puzzle by taking his sword and slicing it in half. He then went on to, indeed, conquer Asia, possibly demonstrating that, at least at times, crime (or at least cheating) does indeed pay. What I most like about the story is how relatable it is to any of us who have been confronted with a puzzle that defies our best efforts. That mounting sense of frustration that comes when an imminent solution hits a dead end. Skates, while on the feet of children and clumsy adults, make for magnificent toys. They allow the user to race, dance, play games and travel. Skates, like those depicted in the above picture, date back to 1863, when New York City's own James Leonard Plimpton invented the Quad skate. I thought you would enjoy these pictures of our great, great-great and great-great-great grandparents enjoying the fun of skating. The above late 19th century skaters look like they are taking it all pretty seriously. Checkers are today, at least in the United States, primarily a commodity. Inexpensive cardboard playing surfaces and plastic pieces have served to cheapen what should be a game which is admired for the complexity of its simplicity. Many a child has experienced their first sense of mastery by defeating a parent or an older sibling in what used to be called Draughts in England, Fierges in France, and Alquerque in ancient Egypt. Here is a look at some vintage games and artwork. The above checker board dates back to the Regency period in England (early 19th century). The colors are dramatic and the game may have been designed for a person of influence. The above painting, "The Checker Players", by American artist George Caleb Bingham, dates to the mid-19th century. I like the feel of small town Americana and the use of muted colors. The above set is French, as you can tell by the words for Noir (black) and Blancs (white). The board appears to be made of wood while the pieces look small, the size of an Othello piece. Above is a beautiful checker board dating to the the late 19th century. The board appears to be made of wood. On the next page is a great daguerrotype of two men playing checkers. It appears to date to the mid-19th century. Love the top hat. I can remember, at the age of four, my older sister allowing me to cut out some of her paper dolls. What was she thinking? I kept clumsily cutting off the paper tabs and can still remember the look she gave me. One that said: "You are the stupidest boy in the world". Needless to say, I have not gone near a paper doll since that time. 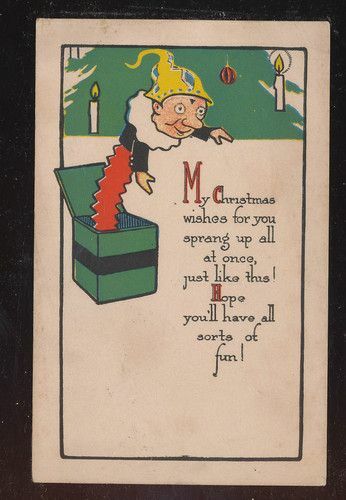 That does not, however, prevent me from taking a look back with you at some of the beautiful vintage paper dolls. 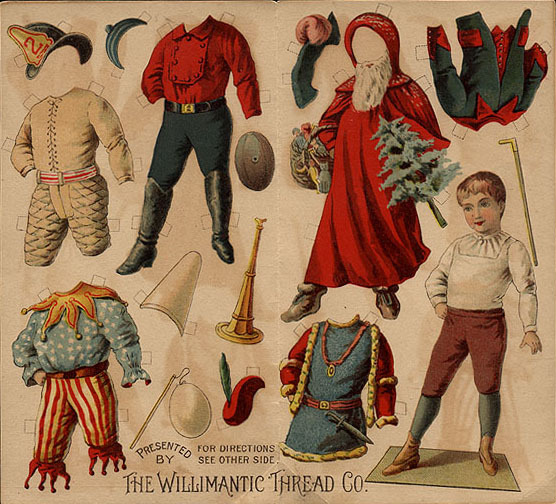 It was early in that century that paper dolls first became popular in Europe. The S&J Fuller company, an English company, began producing them in 1810. Its interesting to think that while the Duke of Wellington was defeating Napoleon at the Battle of Waterloo, women and girls were playing with paper dolls. 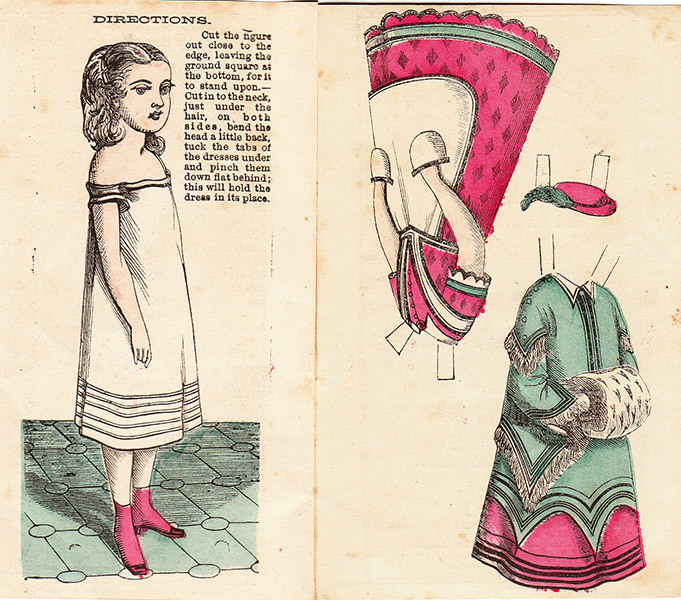 By the way, the French with their love of fashion quickly adopted paper dolls. There are certain forms of play that I am not only unable to do but, when I try them, I typically end up hurting myself. My list includes the Pogo Stick, Stilts and, of course, the Unicycle; a product designed to cause me both the physical pain of falling off and the emotional pain of looking like an idiot. Never-the-less, there are people who, with an air of nonchalance, are able to effortlessly roll around on a Unicycle (perhaps juggling plates while doing so) and all the while smugly looking down on people like me. Despite myself, however, I am secretly jealous. I want to be like that guy at the top of the page, rolling around while playing a trombone. A skill designed to enchant any woman. 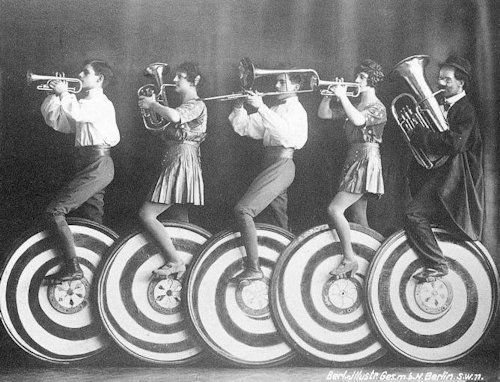 The Unicycle came into being in the latter part of the 19th century. 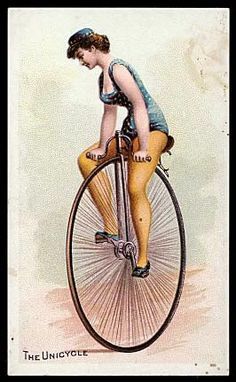 It arose from the discovery by "Penny Farthing"* bicycle riders that they could ride without the smaller wheel by simply pitching forward a little. The below rider did not seem to have that skill. 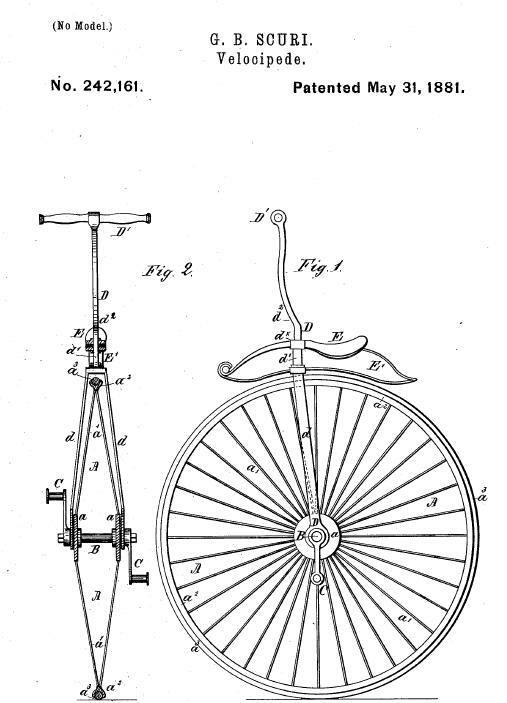 Below, is an 1884 take, a bizarre take I might add, on a Unicycle in which you rode around sitting on the inside rather than on top. I'm not sure how you got in there. I think most of us had a Jack in the Box when we were children. Playing with it felt both fun and a little dangerous as we didn't know for sure when suddenly the door would open. A clown (it was usually a clown) would spring out and we would laugh in excitement. And by the way, if I had had the Jack in the Box depicted at the top of the page I probably would still be having nightmares. Do you ever ask yourself: "What was the "Rubik's Cube" before there was a "Rubik's Cube"? You don't? Well, okay then, I am going to talk about it anyway. Its the sliding number puzzle. It was kind of a 2 dimensional Rubik's Cube with a play pattern similar to the one upon which Thinkfun's Rush Hour is based. It consists of 15 numbered squares and one empty one. The idea was to scramble the puzzle and have someone else try to put them in order. Originally going by names like "15 Puzzle",“Boss puzzle” and “Gem puzzle,” it became a global fad in 1880, ironically 100 years before Rubik's hit the market. It was a global sensation and made many a puzzler crazy trying to figure out how to do it. Below is a copy of a patent for a sliding puzzle made out of wood. The Wright Brothers were not lone inventors living in Dayton, Ohio. They were part of, not just an inventing community, but a toy inventing community. That is what occurred to me as I came upon a book by William Gallagher & Richard Cummings entitled: The History of Dayton Ohio Toy Makers. The book tells the largely unknown story of Dayton, Ohio's role as a major toy inventing and manufacturing center during the early 20th century. In fact, according to the authors, there were 38 toy companies operating in Dayton between 1900 and the Great Depression. To provide some perspective, the population of Dayton in 1900 was only 85,000 people. And interestingly, it was a Dayton based inventor who, in 1897, secured a patent for the first friction operated cars called "Hill Climbers" (see above image*). The Wright Brothers were, when you really think about it, toy manufacturers. 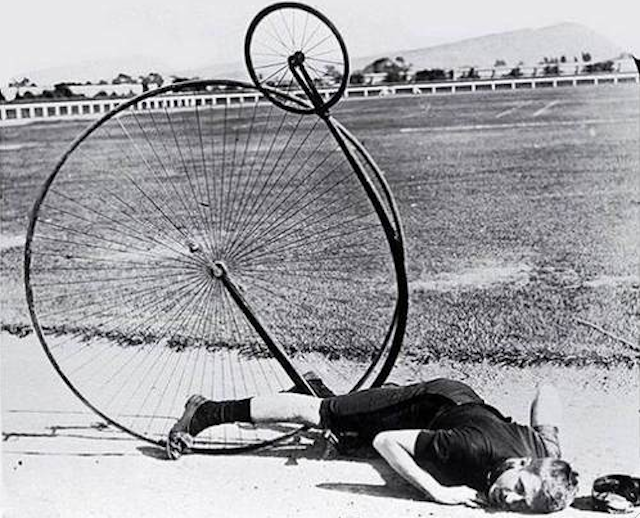 After all, it was their bicycle shop that paid the bills while they invented the airplane. Interestingly, Orville Wright invented a toy called "Flips and Flops The Flying Clowns". Below is an image of the game**. The Schieble Toy and Novelty Company made toys in Dayton, Ohio from 1909 until going out of business in 1931. Dayton, the home of the Wright Brothers, was surprisingly (at least to me) the home of 38 toy companies at the beginning of the 20th century. I guess Orville and Wilber weren't the only entrepreneurs in town. Schieble used tin plate and steel and inserted friction motors to give their vehicles locomotion. Each is, in its own way, quite beautiful. The above airplane looks from around the same time as Lindbergh's Spirit of St. Louis. Very sleek looking car with what appears to be a great looking refurbishment. The below fire engine is, interestingly, yellow and not red. And of course a great, red, battleship. We tend to think of plastic as the miracle toy material of the 20th century. Coming into popularity after World War II, plastic provided a platform for great color, shape and lightness. Interestingly, it was tin that served the same function in the late 19th and early 20th centuries. It is easy to forget what an innovation tin was and how beautifully it took on color. Many of the tin toys were highly whimsical which shows how the use of a more flexible material and intense color was able to open up the imagination of the creator and the end user. Here are some wonderful examples from another time and place. Its Spring, the wind is blowing and that means its "Kite Season". Kites were invented by the Chinese around 2200 years ago. Over the years they have come in many beautiful and inspired styles. Interestingly, it is in Japanese and Chinese art that we find the most artistic depictions. There were a number of important people who passed away in 2017 but one of the saddest was, not the death of an individual but the end of an institution: Ringling Brothers and Barnum and Bailey Circus. In retrospect, it was, in a way, a relic of a bygone era, a time when there was no television much less the Internet. People who would certainly never have gotten the chance to see an elephant, a clown, a high wire walker or a trained seal got that chance for the cost of a ticket. The toy industry loved the circus as can be seen in some of these vintage toys from yesteryear. 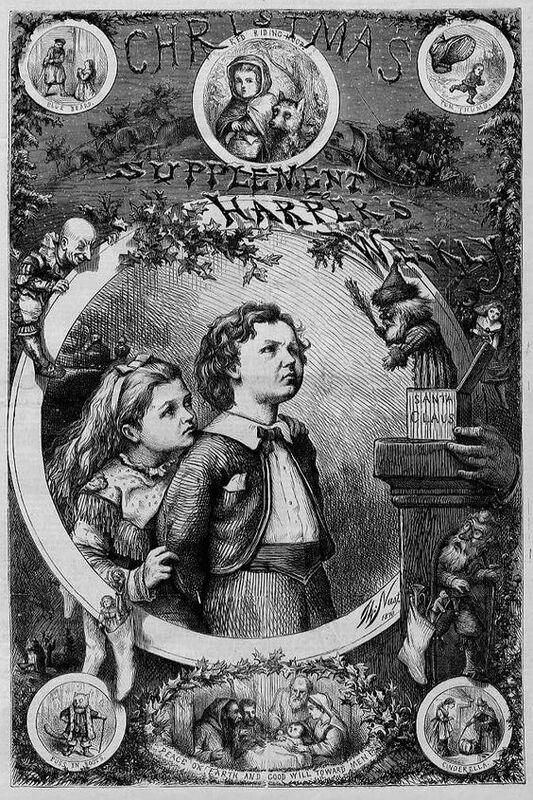 I love the name the Louis Marx company gave to the toy featured at the top. Ring - A - Ling could have either been a very cute name for a toy that rang or it might have been a way of not having to pay a licensing fee; maybe it was both. Beautiful Box from the Schoenhut Company featuring a circus toy that could do "10,001 New Tricks"
I am on my way to Nuremberg Germany for the Spielwarenmesse toy show arguably the world's largest toy show, at least in terms of acreage. 17 buildings cover a lot of space and wear out a lot of shoe leather. Germany is historically the toy industry's founding country. It was in Germany that the industrial revolution moved the world from hand made toys to mass produced manufactured ones. As a result, It was, in the decade prior to World War I, much like China is today, the manufacturing center for the world's toys. At that time, the American toy industry barely existed. World War I put an end to German dominance, however, as America embargoed German toys and, to fill the void, the American toy industry as we know it today was born. I decided to take a look at the toys that Germany was turning out in 1910. To my surprise and delight, I found that many of the toys were wonderfully whimsical to to point of being a little bizarre. Note the wonderful Ostrich Cart, shown above, by the Meier company that sold for a penny in 1910. The below grasshopper with rider also dates back to the same period. It, like the ostrich, is rather bizarre and must have mystified and delighted children. In the image below, a rather haughty man is riding a very well dressed pig. Frankly, I am really not sure what is going on in the picture shown below, but it looks like a dog is pushing a Monkey around in a beautiful cart (note the monkey motif played out on the wheels). Who ever wrote the poetry for this White Kiddie-Kar ad ("Every Monday, Week Begundy, Full of Fundy, In the Sundy") deserved to be shot but the visual is gorgeous. This is a great image with the subtle placement of the bunnies making it extremely charming. Charles Dickens' novel, Bleak House, was the story of a lawsuit, "Jarndyce vs. Jarndyce", that went on for a hundred years. So long that as Dickens puts it: "The little plaintiff or defendant, who was promised a new rocking-horse when Jarndyce and Jarndyce should be settled, has grown up, possessed himself of a real horse, and trotted away into the other world." The toy industry has its own version of Bleak House - Mattel vs. MGA Entertainment. It was a fight to determine the rightful owner of one of the 20th century's most successful line of dolls: Bratz.It is a fight between one very large company, Mattel, and one very persistant man, Isaac Larian. Ultimately MGA Entertainment, owned by Mr. Larian, won the case. Whether Mattel owes MGA additional millions is yet to be determined. And the case continues on. If you will recall, Bratz was a fashion doll that was launched by MGA in 2001 and took a sizable amount of market share away from Barbie. In doing so, it exposed Barbie as being a step behind in terms of contemporary design and out of touch with the racial makeup of a changing America and world. Bratz dolls were funky and the girls were racially ambiguous, appearing to be Asian, African-American, Hispanic and Caucasian and all at the same time. Mattel, in an attempt to control the damage from Bratz went to the courts in order to claim ownership. It seems that Carter Bryant, the dolls' creator, was working for Mattel Mattel when he created his line of dolls. Under his employment contract, Mattel proposed that they owned anything he created while an employee. Mattel therefore claimed they owned Bratz and wanted MGA to pay damages. A new book by Orly Lobel, "You Don't Own Me: How Mattel v. MGA Entertainment Exposed Barbie's Dark Side", tells the story of the tortuous and sometimes tortured journey the main players in this case had to endure. I was not in the courtroom nor in the boardroom so am not in a position to determine Ms. Lobel's accuracy but it does make for a fascinating, if sometimes overwrought, read. The story Ms. Lobel recounts may be entertaining for us but certainly not for those who had to live through it, whose careers were destroyed and in the case of Carter Bryant, the creator of Bratz, his joy for design. Mattel was so intent on maintaining Barbie's style and status as the world's leading doll that it froze an image that progressively went out of alignment with how 21st century girls experienced the world. When a company enforces a worldview that is no longer contemporary, those creative young designers that enter later have a challenging time changing the brand to reflect their life experiences. It is important to have a good businessperson at the helm but it is, at least at a toy company, as important to have one who feels the joy of play and who loves his or her company's products. Bob Eckert was CEO at the time and no one will dispute that he was a Fortune 500 player. There is a telling moment in the book, however, when during the trial he was given an MGA doll and a Mattel doll. He seemed unfamiliar with the products and had difficulty determining which company made which doll. How can you have a vision for your company if you don't intimately know your product. Allow me to propose this theory: If you want to get a sense of how powerful and influential a moment in history was to those living living at that moment, take a look at the games people played at the time. Case in point is a series of games that were published in the first decade of the 20th century that were about the women's fight secure the right to vote in the U.S. and the U.K. The women who fought (sometimes literally) for the right to vote were called Suffragettes or Suffragists. Looking back, we can imagine how the conflict between the genders created tensions within families. One way of dealing with it may have been board games. Consider Suffragetto, a game about police violence and women. Above is the game box and below is the game board followed by the rules. Published in 1908, it focused on the fighting between Suffragettes and police. The point of the game was for the women to make it to the House of Commons without being thrown back by the police.Numerous women were arrested during protests. Some who engaged in hunger strikes were force fed by the police. Others went to the hospital after being beaten. The game attempted to reflect the ongoing conflict by including a hospital area on one side of the board and a police station on the other. 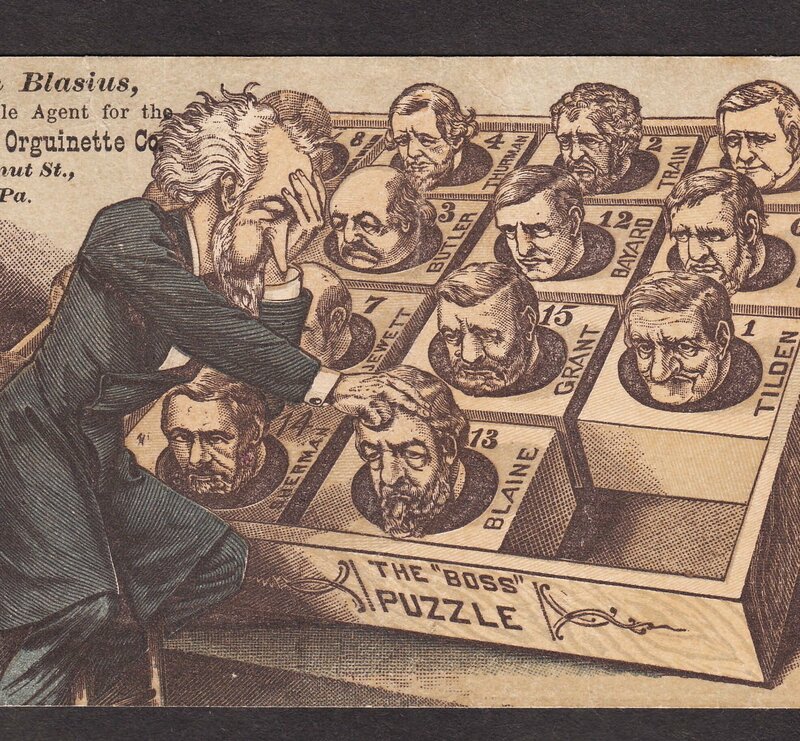 A game with a similar theme is the "Suffragettes In and Out of Prison Game and Puzzle", shown below. Another game about the Suffragettes was "Panko or Votes for Women" which was published in 1909 by Peter Gurney Ltd. It is followed by one of the game cards. 2017 was quite a year. Here are numbers 6-10 for the top stories of 2017. (Click here for numbers 1-5). Mattel turned to Silicon Valley for its new CEO, Margo Georgiadis. Ms. Georgiadis, formerly an executive with Google, made Fortune's 2017 Most Powerful Women list. Her tasks include making Mattel into a fully 21st century company that speaks and thinks technology. Ms. Georgiadis not the first woman to run Mattel, Jill Barad was CEO from 1997 through 2000. Still, it is good for the entire industry to have a woman (and particularly one who thinks digitally) running a major toy company. A tax proposal was floated earlier in the year that would have created a "border adjustment tax" (also called a VAT) on imported goods, toys included. Under the provisions, importers would have lost the right to deduct cost of goods on their taxes. That would have been a disaster for the toy industry which is so heavily dependent upon offshore manufacturing. It, fortunately never came to pass. Married co-executives and founders, Bill Ritchie and Andrea Barthello, decided it was time to sell their company. It was a great pick up for Ravensburger but its a bit sad for those of us who know (and yes love) Bill and Andrea. They are pioneers in educational products and hopefully they won't stray too far. 2017 was a turbulent year for the toy industry. Here are the year's top stories in order of how I see their impact on the toy and play industry. The first five are a little troubling but the second five contain good news. Let me know what you think. This story shadowed the last quarter of 2017. Toys "R" Us, once the toy industry's marquis retailer, found itself loaded down with debt and an aging infrastructure. The company's solution was to file for bankruptcy protection. That was bad news for toy companies who went unpaid and for the retailer's employees who worry for their jobs. This story is by no means unfinished and in the coming year we will learn more about Toys "R" Us's ultimate fate. Bricks and mortar retail is struggling with a record number of store closings in 2017. The culprits being too many stores and the Internet. Fewer doors means fewer dollars for the industry but, never fear, Amazon, Amazon, Amazon and the rest of the e-commerce world are dramatically gaining market share. It was therefore not a time to be worried but to be flexible by making a strong effort to rethink the market place and sell to consumers wherever they shop. At the same time that Toys "R" Us was struggling we learned that Mattel was seeing its revenues dropping. And then we heard a report that Hasbro had reportedly made an offer to buy its rival. This would have created a mega toy company that would have dwarfed the rest of the industry and worried competitors, retailers and licensors.This story seems, at least for now, to have died out but anytime the industry's number 1 toy company seems unsteady on its feet its troubling news for the industry. The Wolverine Supply and Manufacturing Company (later to change its name to the Wolverine Toy Company) was born in Pittsburgh, PA in 1903 and passed on out of existence as a purveyor of toys in 1970. It may have been born in 1903 but it was in 1909 that the company began making toys after purchasing the Sand Toy Company. Sand Toy manufactured the Sandy Andy line of tin toys which Wolverine continue to market for several decades. In reviewing the products, I am struck with how vivid they were both in packaging and product. Some of these toys are almost 100 years old but still look fresh. The Sandy Andy Full Back" (see above) dates to 1919. The player actually kicks the ball with a spring loaded leg (how cool). Some of you may have been around long enough to remember Selchow and Righter, at one time one of our longer lived game companies. Located in Bay Shore, New York, the company dated back to 1867 when it was called Chaffee and Selchow, the company went on to publish notable games like Scrabble (1954), Trivial Pursuit (1982) and Parcheesi (1867). The company was purchased by Coleco in 1986 which was in turn acquired out of bankruptcy by Hasbro in 1989. Toy Companies That No Longer Exist: "The Embossing Company of Albany"
I thought it would be interesting to start looking at some of the toy companies which are no longer with us. Many were major players in their time yet are largely if not completely forgotten today. Take, for example, The Embossing Company of Albany. They were making STEM before there was STEM, in fact, long before. I love the above 1926 ad. It is uncluttered and nicely laid out. It rightly claims that the company had been selling toys since 1870. It lasted 85 years, finally going out of business in 1955 when it was sold to the Chicago based Halsam Products Company. The Embossing Company, known for their wooden toys was, ironically, purchased by a company that made plastic ones. Halsam was eventually purchased by Playskool which was, in turn, acquired by Hasbro. Interestingly, one of the founders of The Embossing Company was John Wesley Hyatt who is credited with inventing the celluloid billiard ball, replacing ivory, an act for which elephants are, I am sure, eternally grateful. In last weeks Breaktime posting, "The Billy Goat Wagon Craze; a look back", I included a letter sent to Santa Claus by a little boy from Richmond, Virginia. The boy's name was Earnest* Mills and was printed in the December 23, 1902 edition of the Richmond Evening Leader. I was fascinated by what he included on his list. There was the afore mentioned Billy Goat and wagon but there were also items like a big orange and candy. I was intrigued that in both letters, yes there were two, he wanted fireworks. I was surprised that a small child would want fireworks so decided to see how they were depicted in the early 20th century. As you can see from the pictures I have included, they were marketed using children and possibly to children. This should not be a surprise because the early 20th century was a time when the U.S. was feeling its oats as a growing military power. It was also a time when children were frequently portrayed playing war (see: "Children Playing War; looking back 100 years"). It was also a time when apparently no one thought too much about safety. For some reason, Goat Carts appear to have been a bit of a fad in the early years of the 20th century. It was the ride-on vehicle of its time. Here is a letter from the December 23, 1902 Richmond Evening Leader from a little boy requesting a Billy Goat and wagon. It speaks to an earlier time when America was a more rural place and where even in cities there was room to maintain a goat and park your wagon. There is something beautiful about the mechanical. That is why I love these antique toy steam engines. They were first produced in the late 19th century and hit their peak in the mid 20th century. They worked like a real steam engine just without the pressure levels. Here are some of the ones I like. As these first national chains rolled out their stores, they were putting small, independent, local retailers out of business. I don't have to tell you that these are some very challenging and at times unsettling times. Old business institutions like Kodak, Sears, Toys "R" Us and Macy's are badly weakened while new retailers like Amazon and EBay are growing at a jaw dropping pace, disrupting our sense of stability. Yet, what I have found is that this is pretty much what was going on 100 years ago. That is what I discovered in a new book by Mike Wallace entitled Greater GothamI. It is a history of New York City in the first 20 years of the 20th century. Just like today, politics and society were in chaos. There was a strong populist challenge to the Republican and Democratic parties. William Jennings Bryan, Eugene Debs and even Teddy Roosevelt led anti-establishment campaigns. And sadly, like today, there were cases of domestic terrorism taking place with bombs going off in places like New York's Wall Street and Chicago's Haymarket Square. While this was going on, new retail juggernauts were coming into being. For example, those of us who remember Woolworths and A&P in the U.S. recall them as old fashioned, fusty businesses. In the early 20th century, however, F.W. Woolworth and A&P were red hot, revolutionary retail concepts. They were hot stocks at the time. I am in China this week so what better time to take a look back at "ancient" Chinese toys which, in fact, are not so ancient. The are, in fact, still very much with us today. Kites appeared in China approximately 2,000 years ago. They were first used for military purposes but, like any cutting edge technology, eventually became toys. Marbles are another Chinese invention, dating back almost 5,000 years. They were made from clay and eventually from porcelain. Flutes date back over 9,000 years and Chinese children have enjoyed them as a plaything for much of that time. Spinning tops were popular with Chinese children as early as 4,000 years ago. They were made of stone, wood and bamboo. I find it fascinating that so many famous toys were rejected at Toy Fair. It was in 1914 that Charles Pajeau, a stone mason from Evanston, Illinois traveled to to New York so he could show his new invention, Tinkertoys, at Toy Fair. 1 Pajeau had no luck convincing anyone to try his new toy. He was, however, like many toy inventors, a persistent person and created his own path to success by convincing two retailers to try his product out during Christmas. It immediately took off and the rest is history. Stonemason Charles Pajeau and partner Robert Petit dreamed up the “Thousand Wonder Toy” in the early 1910s after watching children create endless abstract shapes with sticks, pencils, and old spools of thread. Adding holes on all sides of a round wooden wheel sized for sticks included in the set, they named their creation Tinkertoy. The original Tinkertoys were made of wood and did not come in colors. Smell is a great stimulator of memory and I can still remember opening my can of Tinkertoys and breathing in that distinctive wooden smell. Color was added in the 1950's and Playskool changed the elements from wood to plastic when the company was acquired in 1985. One of the more interesting toy industry origin stories comes from Lincoln Logs, whose inventor was none other than John Lloyd Wright, the son of famed, 20th century architect Frank Lloyd Wright. I have had the opportunity to visit Frank Lloyd's home in Oak Park, Illinois and seen the children's playroom. It was fascinating to see the play space which Frank Lloyd Wright created for his children. It must have been filled with toys that included 19th century construction toys like those designed by by Friedrich Froebel, one of the fathers of the Kindergarten movement. We can imagine how John was effected by the playroom, Froebel's blocks and most importantly by his father's work. It was, in fact, while he was with his father in Tokyo, that John, then a 24 year old man, came up with the idea for Lincoln Logs. His father was in Tokyo for the purpose of designing and building that city's famed Imperial Hotel. The challenge for Wright was in coming up with an earthquake proof construction concept for the hotel. His innovation was the interlocking wooden beam. John, who assisted his father on the project, decided to create a toy based upon interlocking concept. He felt that an interlocking construction element would better allow the toy structures to stay together during rough play. He named the logs for Abraham Lincoln and his log cabin. The company was successful and stayed in business until 1943 when it was sold to Playskool for $800 ($11,622 in todays money). You really don't see cap guns anymore. Once ubiquitous, they went out of fashion as 1970's and 80's parents, worn out by the protracted Viet Nam war, grew progressively weary and and later wary of them. Originally, cap guns were the product of a Civil War gun industry that had to find a new way to generate revenue after the war's end. Below is pictured one of the first toy cap guns. The plate on the rifle's side stipulates the patent at August 4, 1874. Though toy cap guns went on to become a staple, it was not until the 1950's and the 1960's that they had their hay day. During that 20 year span cap guns ruled the toy department and the neighborhood. Buoyed by a seemingly never ending series of cowboy shows on television, cap guns became ubiquitous, with new styles arriving all of the time. The "Life and Legend of Wyatt Earp" was an ABC television show that ran from 1955 through 1961. The Hubley toy company had the license and they produced the above pictured extra long barreled "Buntline Special". A pretend cowboy looked pretty tough roaming the neighborhood while toting one of these. Another popular show of the period was "Yancey Derringer" which appeared on CBS and starred Jock Mahoney. As his name implies, Mr. Derringer carried a derringer which he deftly hid until the right moment. Mattel created a version that was concealed as part of a belt buckle. By pushing out your stomach, you could cause the pistol to flip out and shoot. If you had a cap gun you of course needed caps. The above "Smokey Joe" version was produced by Halco, a company located in Pittsburg, PA. The box states that they provided both "Extra Smoke" and "Extra Fun". Not all cap guns followed a cowboy theme. The above "Atomic Disintegrator" was produced in 1954 by Hubley Manufacturing, a company that produced its first cap gun in 1894.